Ice Queen hasnt seen her friends and family in quite a while now and she wants to go visit them, but what gifts should she bring? 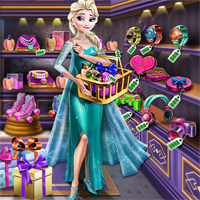 Use your skills to collect the bills and go shopping to see what you can find. If the money isn't enough, don't worry! You can always go back and work more. Her friends will surely enjoy the presents and everybody will have a good time! Farm Day Photo Shoot ..
Dolly Party Dress Up ..